Kkakdugi (Radish Kimchi) is a variety of kimchi made with Korean radish. 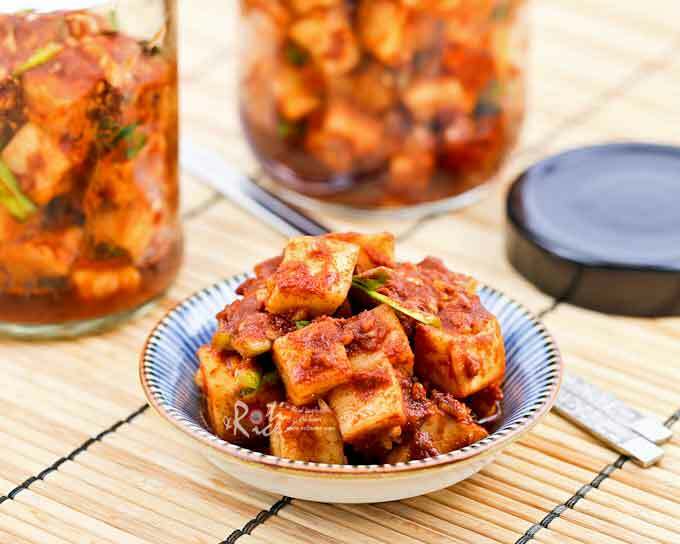 It is a deliciously spicy and crunchy condiment eaten with steamed rice. Kkakdugi (Radish Kimchi) is a variety of kimchi made with Korean radish. It has all the ingredients of the popular Napa cabbage kimchi but Korean radish is used instead of the cabbage. This deliciously spicy and crunchy condiment is best eaten with rice and soup. 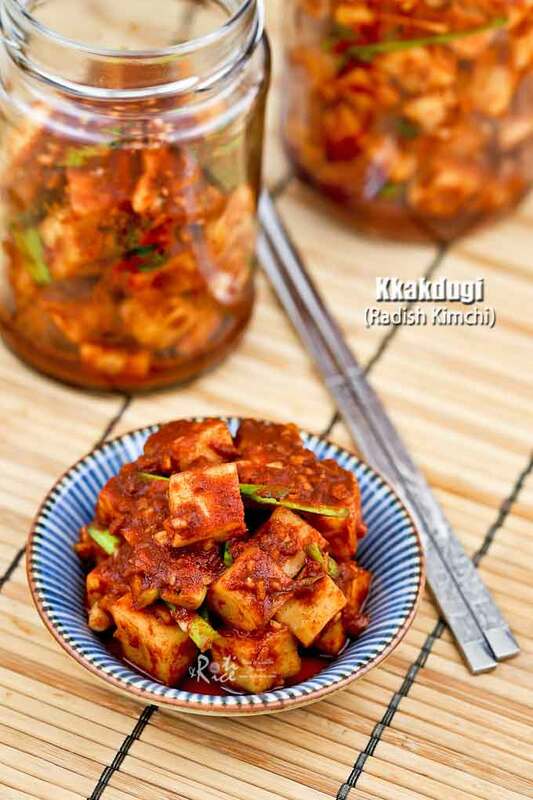 Kkakdugi is not as easily available in stores as Napa cabbage kimchi. I came across this recipe from the cookbook Discovering Korean Cuisine . There are several types of kimchi recipes in there. To date, I have tried three – poggi kimchi, oi kimchi (cucumber kimchi) and Kkakdugi and they are all very good. I keep going back to the Kkakdugi recipe as I like the crunchy texture of the Korean radish. Some specialty ingredients are required to make this kimchi. These are available at most Korean grocery stores. The first is the radish itself. Korean radish is oval in shape with a green tip. 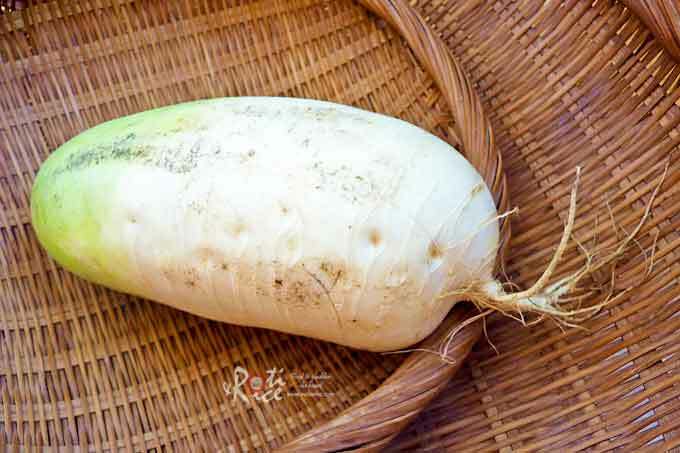 It has a firm, crunchy texture similar to that of daikon but is sweeter and whiter in color. Gochugaru (Korean chili pepper flakes) is a finely ground, vibrant red chili pepper. It usually comes in one pound or larger bags. Unfortunately, regular chili pepper flakes is not a good substitute for gochugaru. Sauejeot (Korean salted shrimp) are sold in jars. Ground or finely chopped salted shrimp gives the kimchi a slightly umami flavor. If it cannot be found in your area, a tablespoon of fish sauce may be used as a substitute. 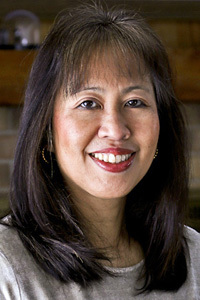 The recipe below was adapted from the cookbook Discovering Korean Cuisine. Peel radish and cut into ¾ inch cubes. Put in a large bowl, sprinkled with salt and sugar. Mix well and leave at room temperature for about 4 hours. In a small pot, add ½ cup (120ml) water with 2 tablespoon glutinous rice flour. Keep stirring as the water heats up and the mixture thickens. When it reaches pancake batter consistency, turn off heat. Set aside to cool. Prepare the sauce by combining all the sauce ingredients and and ½ cup (120ml) glutinous rice paste (from Step 2) in a large bowl. Drain radish. Pour sauce over radish and mix well. Add Chinese chives and continue to mix until well combined. 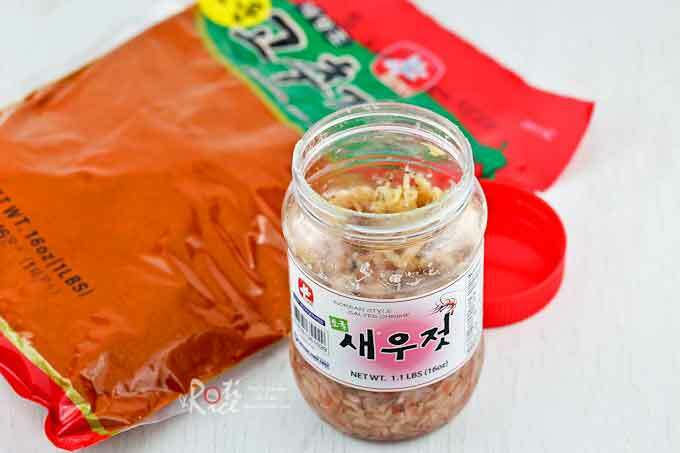 Kkakdugi can be eaten right away or allowed to ferment in the container. It can be kept up to 4 weeks in the refrigerator. 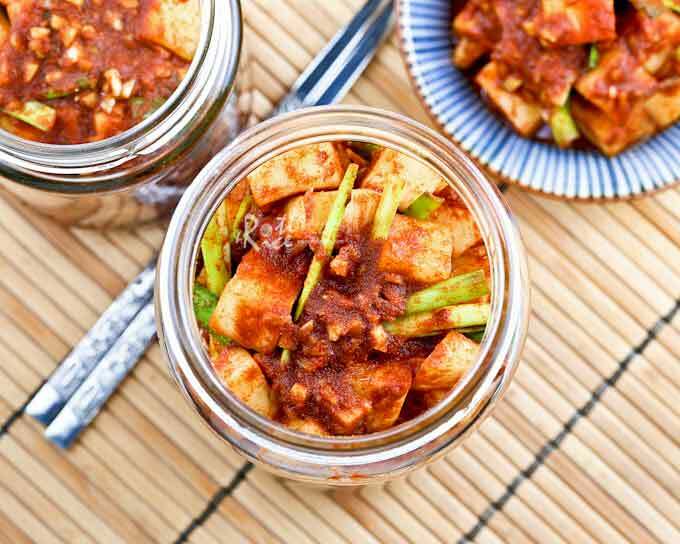 If you like Napa Cabbage Kimchi, you will surely enjoy this crunchy Kkakdugi. Do give it a try. NOTE: This post was updated on September 6th, 2014 with new write-up and pictures. My hubby and I love kimchi. This is beautiful! Anncoo – Thank you! We love kimchi too! It makes the meal more appetizing. Something I've never made and would really love to! Sounds super delicious! Wow..never had raddish pickle…looks nice.. Yes, kimchi! I love kimchi but I still prefer the cabbage kimchi. I've just cooked kimchi chicken yesterday…yum…really delicious. 5 Star Foodie – Korean radish is really nice and crunchy. Do give it a try. A2Z Vegetarian Cuisine – It is very appetizing! MaryMoh – I like the cabbage kimchi too! Your kimchi chicken must be really tasty…yum! I wanted to make this. I made cabbage kimchi the other day. It was delicious. Just wanted to say I made this at the weekend and they turned out to be delicious! We have been enjoying it with plain white rice and pan fried beef slices, adding it to our instant korean kimchi soupy noodles or just eating it on the side with our salad. I shall look forward to making the korean soup with it, if there is any left!